An ESB is expected to function as a service provider as well as a consumer. This tutorial will explain how Mule ESB can be configured to function as a RESTful WebService endpoint. Mule ESB provides a built-in REST component based on Jersey project. In the first example, we will explore the possibility of creating RESTful web services without using the built-in component; in the next example we will create a RESTful web service with Jersey. The mule flow for this example is depicted below. The HTTP endpoint of the flow is configured as below. The examples of the earlier post covered one way HTTP end point, this one covers two way or request-response paradigm. The following configuration settings are done in the ‘General’ tab of the HTTP component. The next component in the flow is Body to Parameter Body. Retain the default values. 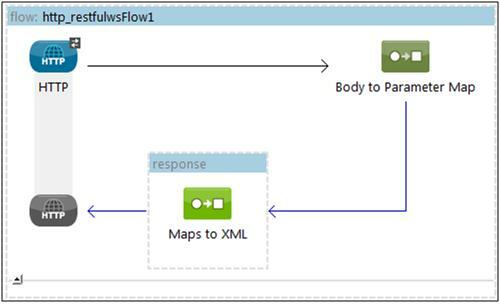 The final component in the flow is Maps to XML component. Retain the default values for this component as well. The output XML structure rendered is the default format of the Maps to XML transformer component. It is not possible to customize this output. For all practical purposes, the developer would like to have the ability to customize the output XML into a more sensible format aligned to business domain. To achieve the same a new Mule flow is created. The HTTP end point is configured as below. Body to Parameter map component needs no explanation. The Maps to XML component has been replaced by a new component namely Object to XML. The configuration of the Object to XML component is below. Use the ‘Advanced’ tab. The Object to XML component uses XStream, an open source XML data binding framework to achieve XML marshalling and unmarshalling. The canConvert method specifies the POJO classes which can use this converter. The marshal method is responsible for the custom conversion of the input Map data structure. The unmarshal method is unimplemented as the reverse conversion of XML to object is not required. The previous two examples covered how to develop a RESTful web service API in Mule without using its built-in REST component. This example demonstrates the use of the Mule REST component. The two methods of RestImpl to understand are getSchoolDetails and getChildrenDetails; the other methods are purely supportive to these two methods. 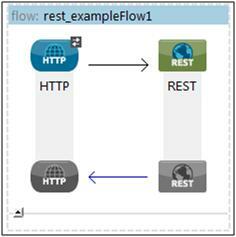 In a typical RESTful web service implementation, the individual API needs to map to URL. The Path annotation with value “/schools” defines the root URL for this class. The individual method level extensions to the root URL are defined using the Path annotation at method level. For the getSchoolDetails method the relative URL path is /schools/, where the user is supposed to submit a valid id value. For getChildrenDetails method the relative URL path is schools//children. Additionally the getChildrenDetails also supports query parameter childid, hence the relative URL is /schools//children?childid=. The rest of the code of the method is self-explanatory. A String containing the response XML is passed to the Response object’s ok method to signify a normal HTTP status code 200 response. One last thing, I have referred to the URLs as relative as they are relative to the path defined in the HTTP end point. The complete URL will include /jersey as a prefix to the relative URLs mentioned above. <http:inbound-endpoint exchange-pattern="request-response" host="localhost" port="8092" path="jersey"
Excellent tutorials – very easy to understand with all the details of the config parameters you provide. change path to jersey/* It will works. Can you please tell me how to send the post request using REST component in Mule, the examples which you have shared all are GET request. Please share POST request example too. Hello Brain, thanks for such a nice tutorial. I am facing the issue when I am trying to consume a web service hosted on an https port. I am getting SSL related issues. Is there any option that I need to set to resolve this issue?